Famous for its Wisdom King and founded in the year 940 in Kozugahara, the Naritasan Shinshoji Temple has been relocated many times, and was finally set at its present site in 1566. The Wisdom King and NAGOMI-YONEYA Although, when it was first relocated, the statue of Acalathe, the God of Fire, was enshrined in the Enshrinement Hall built at Kozugahara, the Boso region of those days was the stage for many wars that gradually began to take their toll on temples in the area, resulting in their ruin. Legend has it that, believing that leaving the statue in the midst of this turmoil was inexcusable, Saburozaemon Morooka, the ancestor of Chozo Morooka, the founder of YONEYA, decided to move it to his estate, where he built a temporary enshrinement hall and made offerings of water drawn from the well on his property to Acalathe. 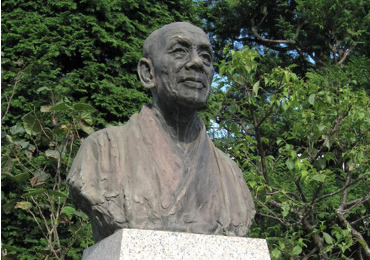 YONEYA has journeyed side by side with the statue of Acalathe down through the long years since the relocation of the main temple building to its present site in 1566. The premises of the NAGOMI-YONEYA flagship shop include the site of the first Wisdom King statue to be relocated to Narita. This garden is known as the site to which the statue of Acalathe, the God of Fire, the principal image of Naritasan Shinshoji Temple, well-known by the name “Wisdom King,” was relocated some 450 years ago. At one corner of this garden is the “Great Well of the Wisdom King,” which is endeared as an exquisite spring. This monument was erected in commemoration of the enshrinement of the statue relocated to Naritasan Shinshoji Temple and was unveiled in a ceremony that took place in 1966. The characters were engraved by Chozo Morooka, the founder of YONEYA. Although the actual well that existed at the time has been buried, the present well from which spring water that gushes from the same underground stream is drawn has been carefully preserved and protected as the Great Well of the Wisdom King. 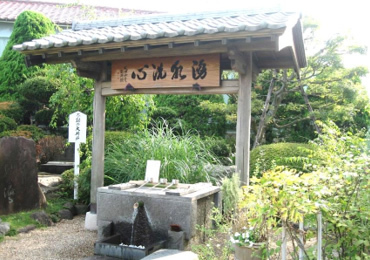 From the days of its establishment, YONEYA has used water from this well to make Yokan. Visitors are welcome to freely draw water from this well. Even now, believing in the legend, local residents and visitors from afar come to draw the famous spring water from this well. 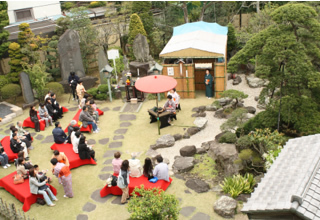 Would you like to enjoy a bowl of Japanese tea in the gardens of the historical site of the Wisdom King? Every April, the Narita-city branch of the Omote-Senke school of tea ceremony holds a tea ceremony at this location on Saturdays and Sundays. Anyone who wishes to enjoy the event is cordially invited to take part at no charge. Chozo Morooka, the founder of NAGOMI-YONEYA, opened a Yokan shop in front of the Gates of Naritasan Shinshoji Temple in 1899. In recognition of his continuing voluntary services to society, Chozo was nominated honorary citizen of Narita City in 1964. At the right of the bust is an engraving of a poem that reads, “Although we watch the rising sun every day with reverence, no-one reveres the shadows cast by the setting sun.” This poem reflects the sentiment of the founder who, with gratitude for the day coming to an end and contemplation of the day to come, used to watch the setting sun eternally with his hands joined in prayer and, in accordance with his dying wish, the monument is turned to face the west.